When out-of-town guests arrive for the 2015 Pro Bowl and Super Bowl XLIX (49) in January/February 2015, there are many opportunities to enjoy winter activities in the Greater Phoenix area. I have put together some suggestions, with a special focus on places that are unique to Arizona. After all, you might not get back to the area for a while, and you’ll want to soak up all the southwestern desert vibe that you can while you are here! Some of these are attractions or activities that you can find all year long in the Phoenix area, although they might be more crowded or more difficult to reserve when there are many tourists in town. The Greater Phoenix area covers a lot of territory and more than 25 cities and towns, many of which are adjacent to one another. People here live, work and play in many of those communities. 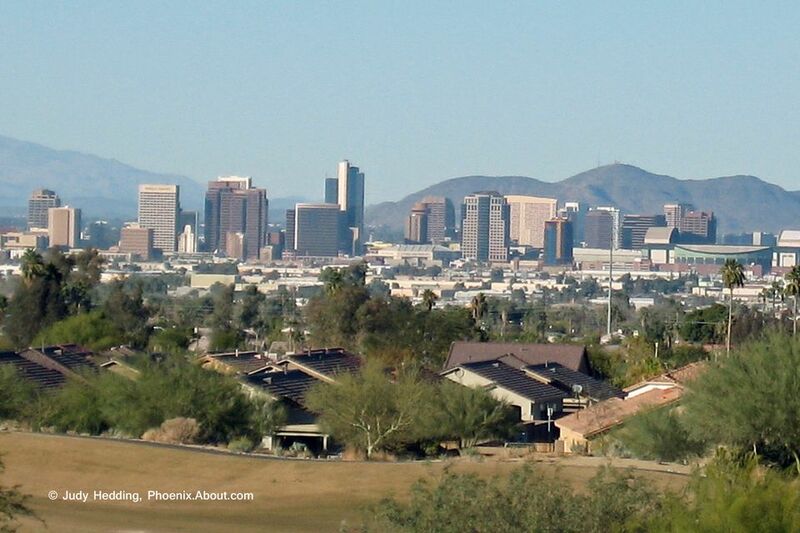 We don’t call everything a suburb of Phoenix; some are major cities that stand on their own. Still, Phoenix is the largest city, by population, in Arizona and is the 6th most populous city in the U.S.
- Phoenix Sky Harbor Airport is in Downtown Phoenix. - Scottsdale is east of Phoenix, and covers about 185 square miles in a 31-mile strip that runs along the eastern part of Maricopa County. Downtown or Old Town Scottsdale is not far from the airport. North Scottsdale is farther. Here is a map of the major Super Bowl event locations around town to assist you in planning your local activities. What is Considered Metro Phoenix? What Do People Mean When They Refer to East Valley and West Valley? Aside from nearly four million people who live in Maricopa County, October through April is considered high season in the desert. That’s because the weather is usually quite mild and there are plenty of outdoor activities that you won't find at this time of year in wintery states to the north and in Canada. So, while you are here, you will find that many rates are seasonable higher. Resorts, hotels, rental cars, golf rates – they are all priced for high season. In addition to you, our football guests, a few hundred thousand people in the Valley of the Sun at this time of year are regular winter visitors, many of whom live here for up to six months in the fall/winter in either their vacation homes or RVs. Where/What is the Valley of the Sun? Do I look like a weather girl? Seriously, I can’t predict the weather. On another page about the Super Bowl I promised that there won’t be any snow. Snow in the desert? Really? Yes, it happens. So does rain. Just not as often as in other parts of the U.S. In the winter we have nights where the temperatures dip below 30°F. The good news is that it is not unusual for daytime temperatures to warm up by 30 or 40 degrees by the afternoon. Keep in mind that the temperatures you will see on the news are those measured at the official weather station at Phoenix Sky Harbor Airport; outlying areas and those at higher elevations will be colder. Does It Rain in Phoenix? Many of the best football players in the NFL will play in the Pro Bowl in Glendale one week before Super Bowl. Of course, the big game. As I write this I don’t know who will play; there are some great teams in the playoffs! The game is played in the same stadium as the Pro Bowl, in Glendale. The official NFL theme park celebrating the big game takes place in Downtown Phoenix. Watch all the media people interview the players and coaches of the Super Bowl teams. It’s quite a sight! You’ll be able to hear some of the interviews, too. It takes place in Downtown Phoenix. Golf events, music events, fashion shows, Fan Fest, Super Bowl Central – these are sponsored by large corporates, like the NFL, DirecTV and ESPN as well as by local communities and everything in between. Some are free and some are ticketed. You’ll want to get out your calendar and plan your time here carefully. I believe you’ll find more wonderful things to experience than you'll have time! If you are visiting in mid-January, you’ll be able to attend some of our annual Classic Car Auctions. You don’t have to be a registered bidder to preview the amazing vehicles that are auctioned here by some of the world’s finest auto auction companies. Phoenix and Scottsdale. Our professional NHL hockey team hopes to howl its way to the Stanley Cup. They play at the Gila River Arena in Glendale. Our NBA basketball team shoots hoops at the US Airways Center in Downtown Phoenix. Arts, crafts, entertainment, wine. Over 150 artists will have displays. This is one of Arizona's largest wine tasting events, featuring wines from Arizona, California, Australia, Germany, Austria, France and Italy. A 10 week event in North Scottsdale. See designers, painters, sketchers and sculptors at work. Demonstrations and workshops, fine wines and cuisine. North Scottsdale hosts over 100 artists from Arizona and elsewhere in its big white tents. The world-renowned Tour Choir will perform new works, sneak peeks at special repertoire and audience favorites. Outdoors. Phoenix. A festival hosted by the Salt River Pima-Maricopa Indian Community showcasing cultural performances and presentations relating to Native American culture and heritage. Demonstrations, storytelling, hoop dancing, film screenings, arts and crafts. Scottsdale. A hot air balloon festival. Fun flights, tethered rides, Hare ‘’n’ Hound races, evening desert balloons glow, vendor village, kids zone. Check for discounted tickets through Groupon. Glendale. Native cultures unite with 100 artists displaying traditional and contemporary jewelry, sculpture, artwork, and handcrafts. Live Native American hoopdancing performances. Free admission. Featuring films from the gay and lesbian community. Paradise Valley Community College. A mix of jam-rock and multi-genre music during a full day of family-friendly fun at Civic Space Park in Downtown Phoenix from 3 p.m. to 10:30 p.m. Food trucks, local craft breweries and a solar powered stage featuring local bands. The park is located at 424 N. Central Ave and is accessible by METRO light rail. The Beer for Brains Foundation, a national non-profit organization of craft beer lovers, distributors and brewers committed to raising public awareness about brain cancer, presents this food, wine and craft beer pairings from sixty chefs, breweries and vineyards. The event will take place at the Musical Instrument Museum in North Phoenix. $95 per ticket, VIP tickets offered. Display of jeeps from World War II, Korea, Vietnam, Desert Storm, conflicts in Iraq, Afghanistan, along with troop carriers and armored cars. These historic vehicles will be judged for originality, military significance, and quality of restoration with awards presented Saturday afternoon. Swap meet of armed service collectibles on both days. West Phoenix. Cheap tickets! See ASU musicians perform in Scottsdale. In North Scottsdale the pro golfers will get together for the first PGA tournament of the year. The PGA Waste Management Phoenix Open Golf Tournament is held at the TPC Scottsdale. This tournament attracts the largest crowds of any PGA event, but it never sells out. If the weather is good, expect record crowds. Steve White (Comedy Central, Def Comedy Jam and more) performs standup. Tickets start at $15. North Phoenix (map). More about Rick Bronson's House of Comedy. This upscale resort in North Scottsdale not only hosts the Waste Management Phoenix Open on the week leading up to the Super Bowl, but it also extended the holiday skating rink to accommodate visitors. Local artisans, live music, make and take projects, interactive art, artistic demonstrations, food vendors. At the Scottsdale Waterfront. A display of Ikebana flower arrangements will be exhibited throughout the Japanese Friendship Garden, designed by Ikebana enthusiasts and talented artists. Phoenix. Moved up a week just for you (it’s usually the weekend before Valentine’s Day) there’s no charge to wander around Downtown Glendale and peruse all kinds of chocolate vendors. Don’t miss the tour of local chocolatier, Cerreta Candy Company. I’m bettin’ there are a bunch of football-shaped chocolates there. People from various local communities walk together to promote unity and diversity. Matinee and evening performances. The Phoenix Symphony brings the world-famous Cirque de la Symphonie to Mesa. The high-flying and talented Cirque troop including jugglers, strong men, contortionists and gravity defying aerialists will join The Phoenix Symphony at the Mesa Arts Center. From 5 to 10 p.m., Bad Water Brewing is hosting the first annual “Brewers Bowl” craft beer festival in the heart of Downtown Scottsdale. Created to showcase the burgeoning craft beer scene in Arizona, the event will feature at least 15 local breweries, plus live music and food trucks. The Brewers Bowl will benefit the Paradise Valley Emergency Food Bank, a food cooperative dedicated to providing emergency provisions to the community’s hungry. The festival will be set-up on Brown Avenue between 3rd Avenue and 4th Avenue, which will be closed to vehicle traffic. General admission is a $25, and includes 20 beer tasting tickets. VIP admission is $45, and includes 25 tickets plus early entry to the event. After the big game, Jimmy Fallon will be at The Orpheum Theatre in Downtown Phoenix broadcasting The Tonight Show live. Tickets are free, but you have to go online to reserve them. Reservations will be taken beginning Wednesday, January 14 at 9:30 a.m. The Orpheum is accessible by METRO Light Rail. Visit more than 70 downtown Phoenix art galleries, studios and art spaces. Free. Downtown Phoenix. 2,000+ pieces of art in a variety of mediums, meet and converse with the artists, wine tasting and musical entertainment. Surprise Recreation Campus in Surprise. Local Canadian residents and winter visitors celebrate Canadian culture with live music, games, and door prizes. South Mountain Park in South Phoenix. Free admission. Gourmet food trucks, contests, entertainment in Scottsdale. Huzzah! It’s a 16th Century faire out in Apache Junction. What is it? A combination of amusement park, shows, comedy, music, feats of daring, street performers, shopping, and indulging. Spread out over 30 acres, and it is easy to spend an entire day there. Apache Junction is southeast of Phoenix. More than 50 Christian bands and musicians. Grand Canyon University, West Phoenix. 100 exhibitors and vendors of fine art, chocolate, and handmade confections. Live music and dance performances. Free admission. Carefree Desert Gardens. The most prestigious horse show in the U.S happens each year in North Scottsdale. Tattoo artists, shopping and contests. Arizona State Fairgrounds in west Phoenix. Rodeo events, parties and entertainment. Sponsored by the Arizona Gay Rodeo Association. West Phoenix. The signature event of Arizona Beer Week is the Arizona Strong Beer Festival with music, vendors and of course, beer. 21+ only. Cocktail enthusiasts, aspiring mixologists, and industry veterans mingle, taste and learn. I hope you’ll be staying in town long enough to get a real feel of the old west when the Parada del Sol takes place in Old Town Scottsdale. It is the world’s largest horse-drawn parade, and there is a festival with entertainment at the end. It’s free! A casual, social self-guided 3.3 mile walk around downtown Phoenix. Evening, rain or shine. Free. Dinners, walks, music, festivals and exhibitions honoring Martin Luther King, Jr.'s legacy and celebrating diversity in Greater Phoenix. Check the concert and show calendars (January Calendar / February Calendar) for dates, venue and ticket information. Stunning displays of Native American art and culture. Phoenix. The diversity of the desert in one beautifully presented destination. Phoenix. While it is not about Arizona or the Desert Southwest, you will not find another museum like this anywhere. Plan to spend quite a bit of time at this amazing combination of music and culture. North Phoenix. Free Native American performances in Downtown Scottsdale at the Civic Center Park. Select dates Jan. 8 through Apr. 4, but for those visiting around Pro Bowl/Super Bowl the date is January 24. Free concerts on the lawn in Downtown Scottsdale at the Civic Center Park. Select dates Jan. 11 through Apr. 5, but for those visiting around Pro Bowl/Super Bowl the date is January 25. For more than 30 years the galleries in Downtown Scottsdale open their doors on Thursday evenings and invite people to stroll in and out and enjoy the art. No sales pressure here. Free. If you’ll be spending time here after the Super Bowl, the first Friday in February is February 6. On that day, the galleries and art spaces in Downtown Phoenix invite everyone to visit. One of the most well-attended art walks in the country, promoting mostly new and up-and-coming artists. Mostly good weather here makes it a popular place for hot air ballooning. Most companies take off from either Southeast Valley or Northwest Valley locations. We have some beautiful areas close by for trail rides, all levels of experience welcome. Enjoy the desert on horseback! If you’d rather wander around the desert on four wheels, there are various places that will either rent off-road vehicles to you as well as take on guided tours. You won’t need a horse or an ATV to sample the offerings of some of our local craft breweries. 21+ only on these tours. Candy companies, stadiums, dairy farms and more. Naturally, you brought your clubs, right? With about 200 golf courses around here not to worry – they’ll rent clubs to you if you didn’t bring them. The courses will be in great condition this time of year. Gambling, shows, fine dining in various locations around town. Two kinds of people will want to know about road trips while the Super Bowl is on everyone's mind: football fans that are here vacationing around that time, and locals who want to get outta town while all the football events and crowds are here? Which type are you? These are all within about two hours from Phoenix. Of course, we have malls like every major city does.